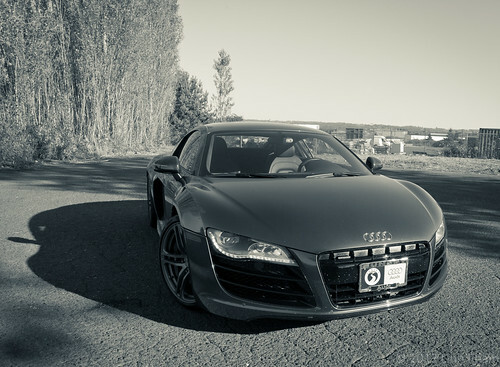 Update: You can view additional posts about my #WantAnR8 experience on this page. 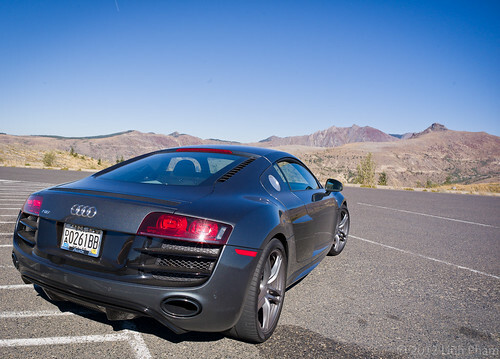 This is the third in a series of blog posts chronicling my #WantAnR8 weekend. 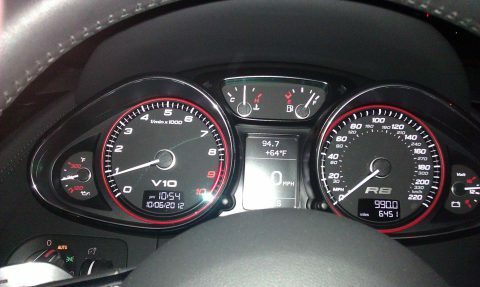 In the past two posts, I covered the run up to the morning of the #WantAnR8 delivery and the big day. After the hectic morning and afternoon that was the #WantAnR8 delivery, filming and driving a couple hundred miles, I finally came home sometime after 19:00 and crashed on the recliner for a little while. After going through the long list of tweets and Facebook notifications, I decided to later go on a nighttime trip out to Mt. Hood and back. The last time I’ve been around Mt. Hood at night was coming back from a company party in a coach bus, half asleep. I grabbed a bit of food to nosh on and filled up my water bottles and headed out of the door at around 22:40. I decided to take the easier route out to Mt. Hood by way of I-84 and through Hood River. In order to get to I-84, I had to go through the Sunset Highway tunnel again… oh darn! Doing the same thing I did last time before entering the tunnel, I dropped from 6th gear to 4th, slowed down and put the foot down just as I entered the tunnel. Oh, I just cannot get tired of hearing that sound! Driving at night, sitting at a stop light. From downtown Portland out to the Hood River and Hwy 35 exit is around 65 miles. It look me about an hour to get out there and the trek also involved another tunnel. While not as grand as the Sunset Highway tunnels, it still gave me a chance to hear the Lamborghini-sourced V10 sing. By the time that I finally got on to Hwy 35, midnight had come and gone. While there were a couple of cars on the highway, that didn’t last too long as it became a nice, desolate highway about 10 miles in. 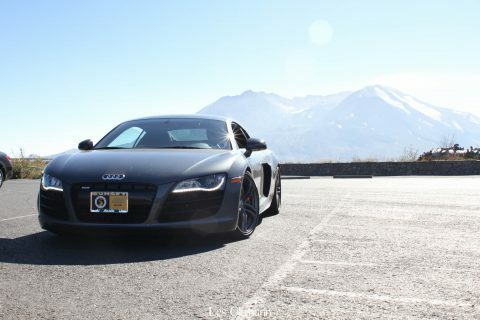 It was just me, the R8 and the hills, dips, twists and turns that made the drive worthwhile; even though, I was still a bit tired and it was a bit too cold to have the windows down a bit to catch more of the engine and exhaust. Since there weren’t any street lamps around (that’s a really good thing), using the high-beams was a must throughout most of the drive up until I got to the Hwy 35 to Hwy 26 interchange. At that point, there was enough signs of civilization to negate the need for high-beams and it also meant speed limits going from 55 down to 45, 40 and even below 30 at some points. This made some of the longer stretches back towards Portland seem longer than it should be; and it also meant a lot less curves and dips. Nonetheless, I was still entertaining myself with the occasional downshifts to hear the throttle blip. Since the R8 had an R Tronic gearbox, it wasn’t quite as satisfying as it could have been with the manual gearbox and metal shift gate. The drive got a bit boring as I passed Sandy and turned off of Hwy 26 and on to Hwy 212, heading towards Boring. Even though taking this route meant that I would have to slow down even further as I passed through small towns, there were enough curves to make it less monotonous. By the time I got home, it was almost 2:30. Decided to check Twitter and Facebook one more time before falling asleep. Later that same morning, I finally crawled out of bed at around 9:00 and started planning how I wanted to spend the remaining hours with the R8. So, bolted out of the apartment with my Leica and GoPro in hand and started to drive out towards Banks. 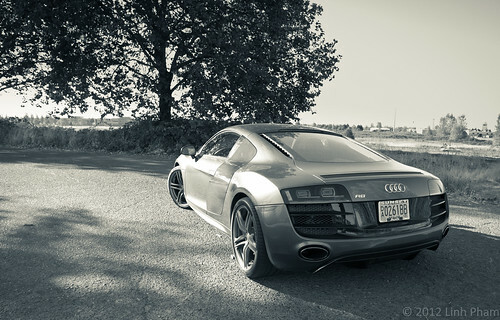 I headed back and stopped out by an area that I used to work for another short photo session with the R8. Having promised one of my friends, Les Oltmann, a ride, I drive up to his home and picked him up. Next destination? Mt. St. Helens. Due to time constraints, we took the new tourist-y route to the mountain; which meant, taking I-5 north to Castle Rock and start heading east. Considering that it was already mid-day, there were not as many cars on the road as I had expected. The road was in good condition and the curves allowed me to have fun. We came up to the Johnston Ridge Observatory, but there wasn’t really any place to park the R8 and take pictures of it and the mountain. So, we went back a little bit and stopped by another viewpoint for a photo shoot. 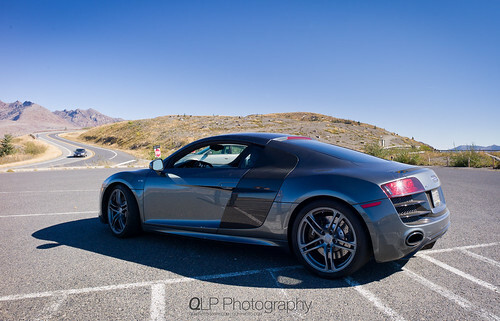 Both he and I took the opportunity to stage the R8 and battled the harsh sun for a couple of shots. 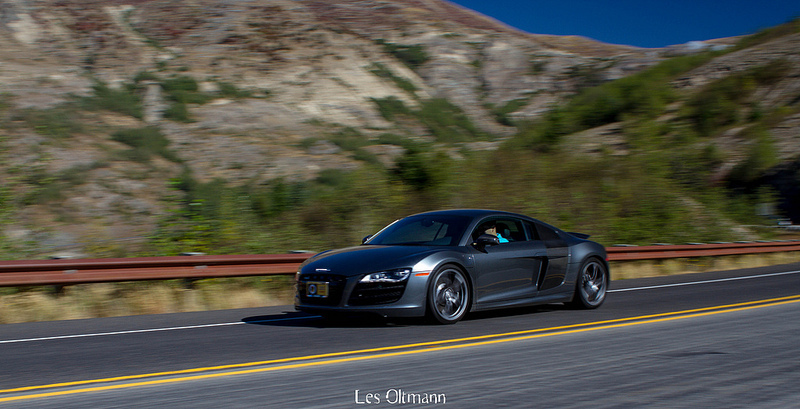 While taking photos at the viewpoint, Les was interested in taking some photos of the R8 driving by. We drove back down the road a bit further and spotted a nice turn out points. Les got out of the car and staged his shots; meanwhile, I was driving back and forth between several other turn out points. Below are some of the resulting photos. As my weekend with the R8 was winding down, we decided to head back. I dropped him off and took a leisurely drive back. Since I couldn’t get enough of the sound of the R8 going through a tunnel, I decided to go through the Sunset Highway tunnel yet again. This time, there were a bit more cars going through the tunnel; but, never mind that, I was still able to drop down a couple of gears and happily filled the tunnel with the awesome sound of the R8’s V10. What happens next? Check out the fourth and final post in this series tomorrow! Whooooah what spectacular backdrops you have to choose from, lucky you! 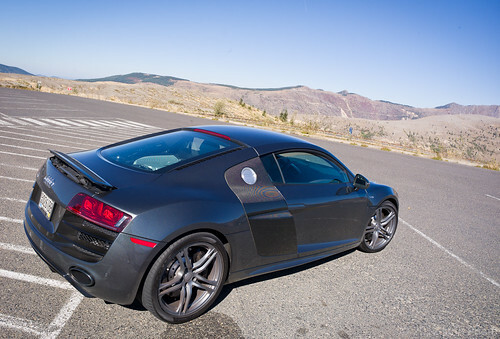 Wonderful photos too, but can an R8 look at all bad in a photo? Oh I forgot to say; I really like the mutedness of the R8 interior. It doesn’t need bling at all. I just love how cockpit-like the interior is of the R8. Piano Black would be my choice for the inlays as it adds some shine, but doesn’t quite look as in your face as Carbon Fiber does. I didn’t get a chance to grab any of the tunnel hoonage. If I get a chance to drive an R8 again, I’ll see if I can record it. The wee VW up! I drove had a piano black inlay across the dash and to be honest I’d go for one without. It was covered in dust; and as soon as a speck lands on it, it’s very obvious. Plus fingerprints show up pretty badly too. Waaaaa no tunnel hoonage! WAAAAAA! I haz a disappoint. I had that concern when I was thinking of which inlay to get for my S5. I guess if I were to own an R8, I would spend some more time than I do now to keep the interior clean. Hrm… does this mean the interior of your S5 isn’t clean now?! My S5 is pretty clean in the inside, but there isn’t as much shiny parts that pick up fingerprints and shows dust.